Here are 2 versions of what is known in Ghana as chichinga (with the first "i" pronounced like the "i" in "it," and the second one like a long "ee", and the emphasis on the second syllable [chiCHINga]. It's also spelled "kyinkyinga," in which case the first "n" is silent. This popular street food, appetizer, and party snack is common throughout West Africa. 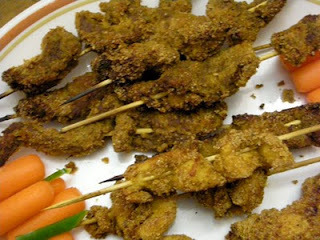 In Nigeria this version of kebab is called tsire suya (sooya), often shortened to simply suya. 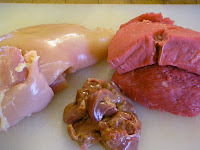 Chichinga is commonly made from a variety of protein sources, such as liver or beef (more traditional), and chicken (more contemporary), lamb, or goat. I'm sure it would be possible to use vegetarian sources like mushrooms or tofu, as well. The distinctive touch comes from the rub, the tankora/yagi/chichinga powder, which includes roasted cornmeal, pulverized and fried and then re-ground peanuts, ginger, red pepper, salt, and other spices. Typically in Ghana the meats are quite tough and the chichinga are grilled for a long time so that they sometimes taste overcooked according to Western sensibilities. Once you have purchased or prepared the powder, you're set to go. 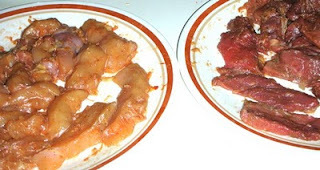 To make enough for 3 persons, use 12 ounces of tender beef with all fat trimmed off, enough to cut into about 18-21 thin strips, roughly 1/4-3/8 inches thick, and a couple of inches long and around an inch wide (you'll see both the chicken and beef strips in the picture). Prepare the marinade and mix it together, then coat the meat evenly with it and let it sit (in the refrigerator) covered, for about half an hour or longer. 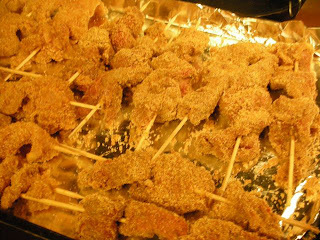 put a cup of the kyinkyinga/tankora/yaji powder in a plastic or paper bag, and add about 6 pieces of the marinated meat at a time, shaking them well to coat them (in Ghana they actually coat them after they put them on the skewers, but the bag procedure works better for me. Thread 3 pieces of meat onto each skewer. Continue repeating this process untl all the meat is coated and on skewers. 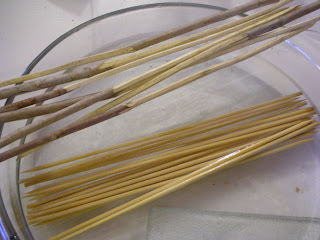 Do not push the meat down too tightly on the skewers. I lightly brushed the kebabs with a little peanut oil before putting them under the broiler, turning after 5 minutes and brushing the other side lightly with oil as well, then giving them another 5 minutes or so. Since we weren't quite ready for them, I turned the broiler off and let the sit in the over for another 20 minutes or so befoe we were ready to eat. This version is the identical process, but uses chicken instead of beef. Since North American chickens tend to be so soft, it is more flavorful and interesting to use a roasting (or free-range) chicken. In Ghana, I usually find the chicken version is made from white chicken breast meat, but I include a few from the darker, moister thigh meat and that works well also. Follow the same procedure for marinating, coating, and grilling. Variation: It is also possible to grill the meat directly, without using the tankora powder, but you'll be missing a treat. 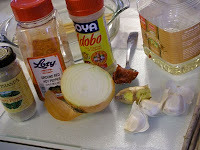 Chichinga goes very well with a lager beer (like Star or Club in Ghana), or ginger beer or ginger ale or bissap.